Engraving is another word used for Gravure printing. This is the reverse of flexography or letterpress, where the image is derived from the indentations of the image on a flat surface. The indentations or engravings carry tiny amounts of ink that transfers to the paper. 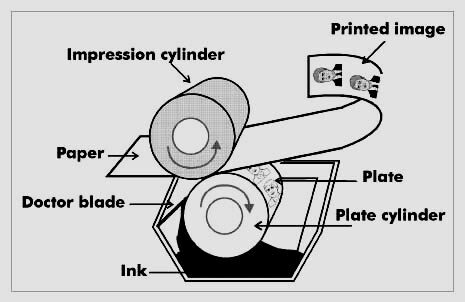 The cost of the cylinders required to print in the gravure process are prohibitive for short runs. As the runs get larger and larger, the gravure process and the cost of the engraving of the cylinders become more affordable as the image does not deteriorate over the length of the print run. To produce cheap printing for Brochures, Sell Sheets, Flyers, Leaflets, Business Cards, Post Cards etc., this process proves to be too expensive to be utilized for these items.